ZooKeeper Data Buffer Management provides the user the ability to effectively manage from 1 to 1000 TR-2100 Data Buffers in the field. ZooKeeper is made up of 3 major components as described below. Every TR-2100 includes an ethernet port and a web server. Simply by using your web browser, you can quickly and easily access the TR-2100 to view its status or setup. A windows based application, the ZooKeeper Configuration Utility provides a GUI (graphical user interface) for easy verification and changes to the TR-2100 configuration. 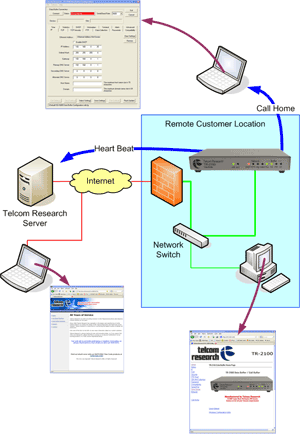 This utility connects to the TR-2100 by a variety of methods both local and remote. The ZooKeeper CallHome functionality provides features allowing the TR-2100 to periodically communicate its status directly to a central server. The central server can then provide proactive information on Data Buffers that have not checked-in recently. The CallHome functionality can also be used to direct a remote TR-2100 to connect to a technicians notebook anywhere in the world without the need for changes to your customers FireWall.